The First World War constitutes a point in the history of New York when its character and identity were challenged, recast and reinforced. Due to its pre-eminent position as a financial and trading centre, its role in the conflict was realised far sooner than elsewhere in the United States. This book uses city, state and federal archives, newspaper reports, publications, leaflets and the well-established ethnic press in the city at the turn of the century to explore how the city and its citizens responded to their role in the First World War, from the outbreak in August 1914, through the official entry of the United States in to the war in 1917, and after the cessation of hostilities in the memorials and monuments to the conflict. The war and its aftermath forever altered politics, economics and social identities within the city, but its import is largely obscured in the history of the twentieth century. 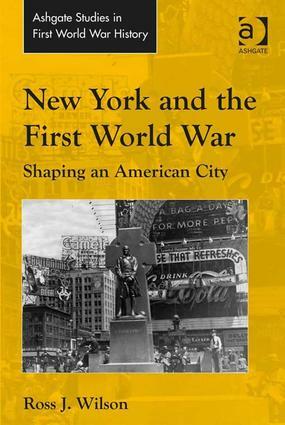 This book therefore fills an important gap in the histories of New York and the First World War. Introduction; New York before the war; The outbreak of conflict; Charity and suspicion; Preparedness and identity; One city, one nation, one loyalty; Conclusions; Bibliography; Index. Ross J. Wilson is Senior Lecturer in Modern History and Public Heritage at the University of Chichester.